Five years ago, Matthew Weiss had an idea. The Chelsea resident and father of three was frustrated by the lack of outdoor play space for kids in the neighborhood, so he decided to see if he could campaign for one. The Department of Sanitation had just closed a facility at 136 W. 20th St., and Weiss thought the adjacent parking lot would be a perfect location. Thousands of hours of petitioning, letter-writing, campaigning and organizing later, city officials gathered Nov. 8 to announce that a $5.8 million park would be developed at the vacant parking lot. The adjoining Department of Sanitation facility will also be torn down to develop the park, which will cover more than 10,000 square feet. “We saved paradise and tore down a parking lot,” said Brad Hoylman, a state senator representing Manhattan’s 27th District, which includes Chelsea. 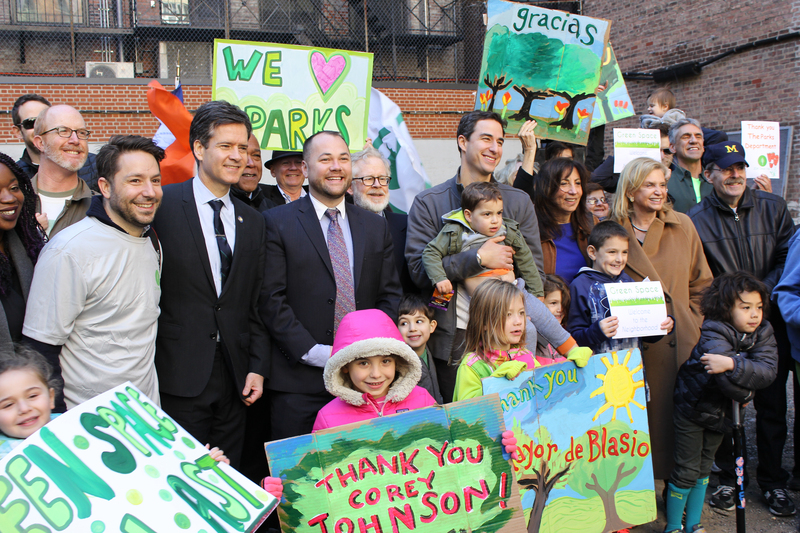 Hoylman, also a member of the state senate’s Environmental Conservation Committee, joined Mitchell Silver, chairman of New York City’s parks and recreation department, and City Councilmember Corey Johnson at the event at the future site of what will officially be called 20th Street Park. Chelsea, which is part of Community Board 4, ranks last out of Manhattan’s 12 community boards, and 58th out of all 59 New York City community boards in number of parks accessible within a quarter-mile of residents. The push for the park was the labor of vocal residents like Weiss, said Johnson. Weiss said the cause has been his “full effort” for five years. After speaking with neighbors who shared his frustration, the 37-year-old assembled a coalition. Friends of 20th Street Park soon materialized, long before there was a 20th Street Park. It was not an easy goal to stick to, other members of the group said. In fact, Johnson said Community Board 4 considered working with the city to convert the space into 75 units of affordable housing. 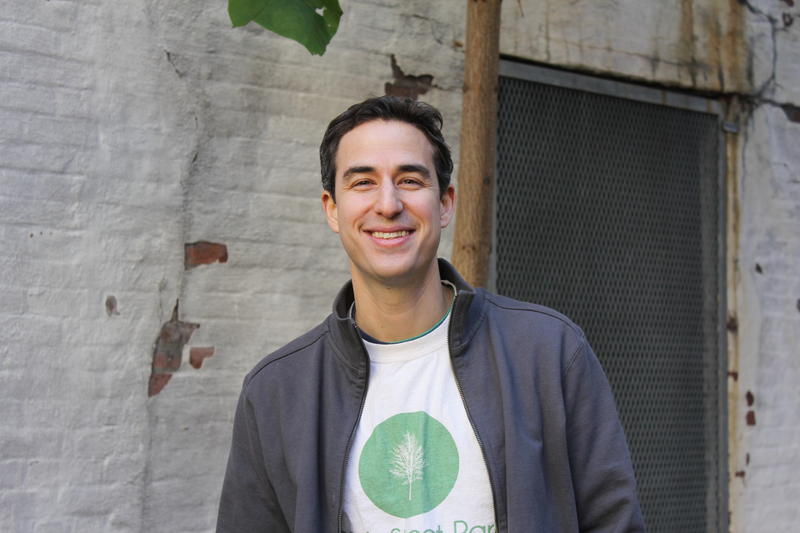 Park advocates say Weiss worked tirelessly to organize and plan events like a “pop-up park” in the space in order to garner support from legislators as well as community members. Ultimately, in what politicians and advocates branded a “tremendous win-win solution,” plans to develop 200 units of affordable housing were secured elsewhere in the area. Not everyone in the neighborhood is happy about the announcement, however. In nearby Chelsea Park, which is between Ninth and Tenth Avenues on 27th Street, some feel that their needs have been neglected in recent local developments. Chelsea is one of the city neighborhoods with the biggest income gaps, according to research from the Furman Center for Real Estate and Urban Policy at New York University. The median income now hovers around $140,000 yearly, almost five times the income of most residents living in local public housing. Other public housing residents welcomed the new park. Kelly Mealia, a new mother who lives near the proposed park, agreed. Officials said that 20th Street Park should open in Feb. 2019. Chelsea residents will have the opportunity to provide input on the park’s design as early as next spring.